For the first time in Sri Lanka, LG Abans Quick Mobile Service Bus was launched yesterday in Colombo, to offer their customers the benefit to repair and service their equipment by factory trained technicians and engineers. Here Mrs. Aban Pestonjee, Chairperson of Abans Group at Abans Service Centre in Wellawatte yesterday. 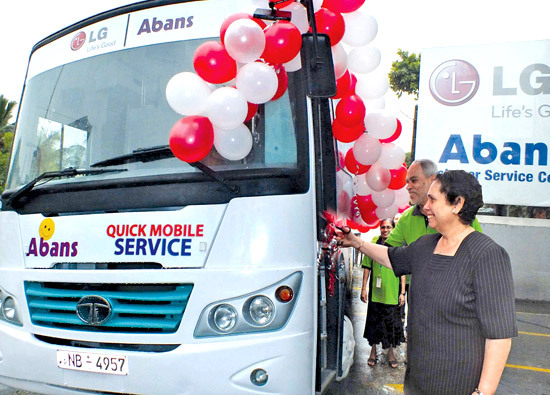 LG - Abans Quick Mobile Service bus was formally launched by Mrs. Aban Pestonjee, Chairperson of Abans Group yesterday at Abans Service Centre in Wellawatte. LG Abans Quick Mobile Service Bus is a unique concept and the first of its kind in Sri Lanka. The bus is equipped with the very latest sophisticated machinery for precision repairs, service and maintenance of electronic and electric home appliances sold by Abans and experienced, factory trained technicians and engineers. The bus also has a sitting area for customers who can relax in comfort and watch TV/Video while their equipment is being serviced/repaired. The bus will visit towns and cities islandwide and undertake on-the-spot instant repairs and service of all brands of electronic and electric home appliances sold by Abans. Abans customers will be notified by advertisements in the press informing them of the date and venue where the bus will visit. Service and repairs will be undertaken on a first come-first serve basis between 9.00 a.m. and 5.00 p.m. on the specified dates. 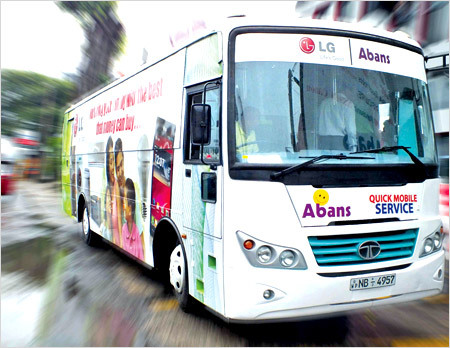 The venues that Abans Mobile Service Bus will visit in December 2012 are as follows: Abans Showroom, Negombo on December18 and 19, Katuneriya Church Junction on 20th December, Pearl Cinema Chilaw on December 21 and 22 and Abans Elite Showroom Welisara on December 23. There will be fun and games and video movies for children as well as adults at all sites that Abans Mobile Service Bus will visit. So remember to keep the date free for an enjoyable day as well as fruitful days where you can get your home appliances serviced and repaired by experts with genuine spare parts and also get expert technical advice on any complex matters about their appliances. 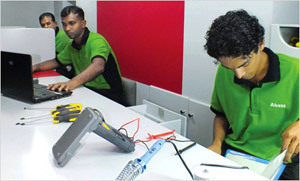 Abans Service Centre has its head office located at Galle Road, Wellawatte and has over 100 Service Centres and Authorized Service Agents islandwide. Abans advice their customers not to give their expensive equipment for service or repairs to unauthorized persons who are not geared to handle precision equipment and who do not have access to genuine spare parts. Abans also cautions their customers that any equipment purchased from Abans and given to unauthorized persons for service/repairs will render the warranty given by Abans as null and void. Abans customers can no be content that the Abans Mobile Service Bus will visit their area on a regular basis and help them to maintain their appliances in peak condition.